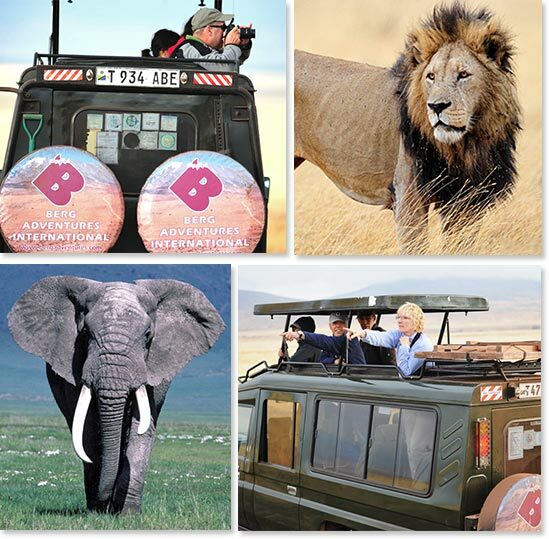 "The safari experience was above and beyond any description you will read in a brochure." Berg Adventures' superbly organized, custom safaris are the finest way to experience the exhilaration of being on a wildlife safari in Tanzania. 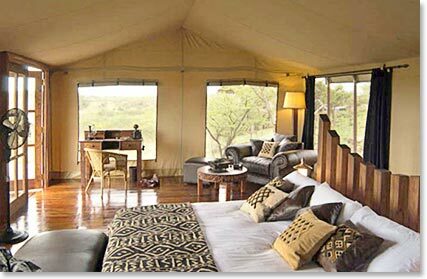 We know of no finer adventure than being in the wilds of Serengeti, at Ngorongoro Crater or in Tarangire with BAI. 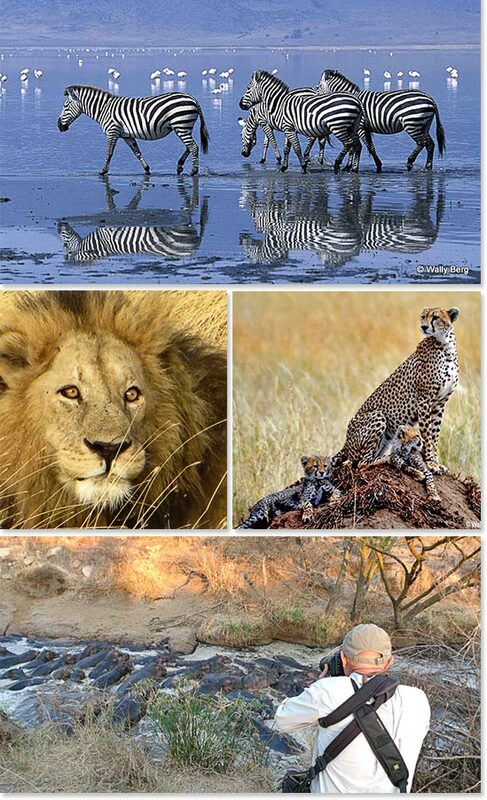 Our safari guides love their jobs and the depth of their knowledge and their sense of fun will impress you. Our vehicles are the finest and we pride ourselves on our unique itineraries. 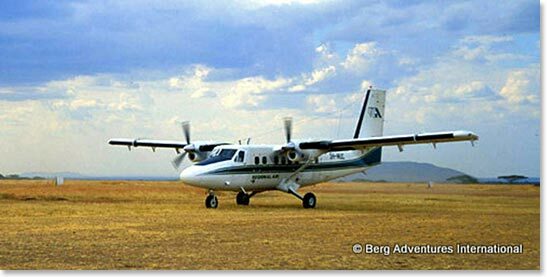 Each Berg Adventures safari is different. Many of our Kilimanjaro climbers will take advantage of doing “two trips of a lifetime in one” by following their ascent of Africa’s highest summit with one of our luxury safari adventures. Family members and friends often travel to Africa to join in the fun after climbers are off the mountain. 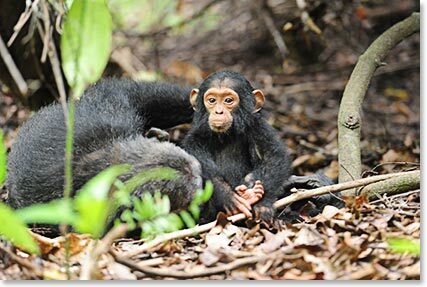 Our 3 and 6-day safari itineraries are perfect for these combined Kili – wildlife safari adventures. 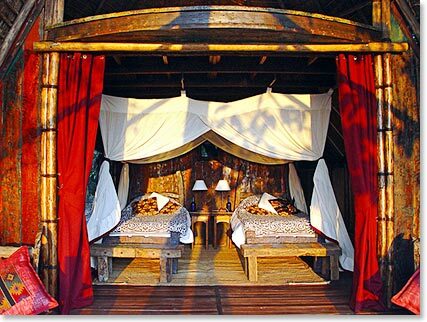 Once you have decided on dates we will present you options for safari lodges or tented camps to match your trip to your budget. Like our itineraries our lodges are carefully chosen. We value location and excellent service. Each day and each hour of a BAI wildlife safari are carefully planned. You will have time to relax in some of the most beautiful, wild settings on earth, but our safari guides also value early starts and know how to get you away from the crowds. 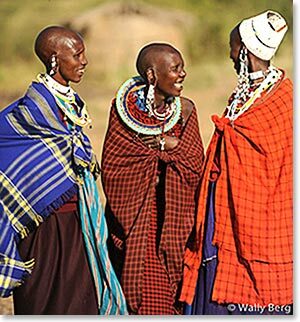 Our cultural tours open doors to the varied, colourful and fascinating life of the peoples of Tanzania. 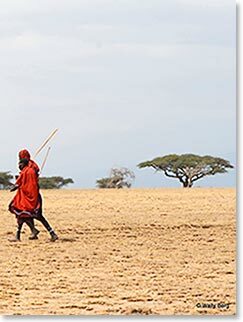 From the stately, photogenic Maasai, to the primitive Hadzabe tribe of hunter-gatherers and to the productive farms on the slopes of Kilimanjaro you will know and appreciate the people of this remarkable country. BAI also caters to private trips for families or corporations. We often have family and friends join Kilimanjaro climbers for a safari after the climb. We invite you to check the archived dispatches from some of our past trips that combined climbing and safari adventures for groups. Greystoke Mahale is a very special place. Tucked away on the shores of Lake Tanganyika, it is one of the most beautiful, unusual and remote places in Africa. The accommodations are individual bandas made out of the wood salvaged from old dhows. Each bedroom opens to expansive lakefront views. From trekking with the chimps, fishing in the deep, clear waters, bush walks, bird watching and swimming under pristine waterfalls to sitting by the fire with your feet in the sand after an evening of divine dining a few days spent at Greystoke Mahale will make for unforgettable memories. Our safari guides are consummate professionals. All of them have worked with Wally Berg for many years, and their energetic dedication to finding superb wildlife-viewing adventures and to teaching about the natural world is legendary. Whether you are simply standing in the back of the Land Cruiser to marvel at a view, or are working with your still camera, video camera or binoculars, your safari guides are constantly attentive to your comfort, to the light around you, and to the angle of each person’s view. They will be teaching constantly as we travel through the wild lands of northern Tanzania, and you will find them to be entertaining and skilled. They love their jobs and it shows!